Any routine eye exam should always include a careful look at the retina, which is located at the back of the eye, to screen for abnormalities or disease. The sensitive tissue that makes up the retina is susceptible to a variety of diseases that can ultimately lead to a partial loss of vision or even complete blindness. Early detection of any retinal abnormality is thus crucial. Previously, this screening was done by dilating the pupils, a procedure that many patients found uncomfortable, inconvenient and time-consuming. Smaller. Smarter. Simpler… Our cutting edge retinal imaging technology is customized to fit the needs of your practice. The next generation of Optos technology, California has been scaled to accommodate smaller office spaces while providing ultra-high resolution imaging, and adding ultra-widefield autofluorescence capabilities. The Optomap exam is simple: at the push of a button, we can generate a computer image of your retina for immediate review. Experience with this technology has already led to improved disease detection and has possibly prevented vision loss and blindness in patients. In our continued efforts to bring the most advanced technology available to our patients, Lucent Family Eye Care is proud to announce the inclusion of the Optomap™ Retinal Exam as an integral part of your eye exam. The Optomap will produce the most comprehensive image of your retina, and allow us to perform a more thorough exam than was previously possible. The result is that we can better prevent or reduce vision loss in our patients with a simple, quick and patient-friendly new exam. We are concerned about retinal problems including macular degeneration, glaucoma, retinal holes or detachments and systemic diseases such as diabetes, stroke and high blood pressure. These conditions can lead to serious health problems including partial loss of vision or blindness and often develop without warning and progress with no symptoms. An in-depth view of the retinal layers (where disease can start). 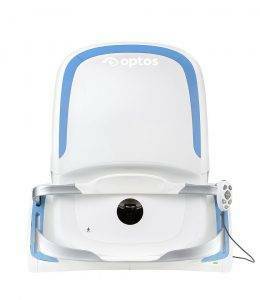 The ability to review your Optomap retinal image with your doctor during your exam. An annual, permanent record for your medical file, which gives your doctor comparisons for tracking and diagnosing potential eye disease. Is fast, easy, and comfortable. Will NOT require dilating drops (which result in blurred vision and sensitivity to light). Insurance typically does not cover any advanced screening technology beyond the basic eye exam. We will be performing the Optomap Retinal Exam as an enhancement to the basic eye exam for a nominal fee. Red and green lasers; each wavelength provides information for interpretation and diagnosis.